At Thursday night’s debate in New Hampshire, Hillary Clinton asked Bernie Sanders to speak his subtext. And then, Sanders did. And it was one of the most riveting ten minutes of debate in the history of American presidential politics. Sanders and the crowd did a Jerry Springer-esque “ooh” sound at the word smear. Then the Vermont senator agreed to talk about the issues, asking whether the deregulation of Wall Street in the nineties had anything to do with the money the financial industry spent on campaigns and lobbying. Or if the fact that “the price of your medicine can be doubled tomorrow and there’s nothing the government can do to stop it,” had anything to do with the campaign spending of pharmaceutical companies? Or if the impossibility of passing comprehensive climate-change legislation had anything to do with the giving of fossil-fuel producers? “There is a reason why these people are putting huge amounts of money into our political system and in my view it is undermining American democracy,” Sanders said. While still refusing to explicitly accuse Clinton of being corrupted, Sanders appeared to be arguing, at the very least, that her participation in the corrupt campaign-finance system helped to perpetuate its existence. Clinton responded by agreeing that she has spent much of her career on the receiving end of plutocrats’ political spending — but in an entirely different sense. “When I took on the drug companies and insurance companies, they went after me with a vengeance,” Clinton said, speaking of her efforts to pass universal health care in the early nineties. Then, she pointed out the bizarre irony that Sanders had actually benefited from anti-Clinton conservative money in this very race, claiming that Karl Rove and company had bankrolled negative ads against the former secretary of State, on the apparent theory that Sanders will be easier prey for Republicans come November. Finally, Clinton noted that Sanders was the one who did Wall Street a solid in 2000, when he voted to deregulate swaps and derivatives — as a certain former Democratic president had proposed. Good lord, HRC attacking Sanders for voting for her husband's financial deregulation again. 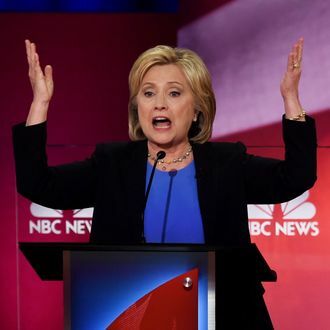 Up until Thursday, the Democratic debates had been barely more entertaining than any random hour of CSPAN. But the candidates’ showdown over the role of money in politics was both edifying and electric.